"Oak Father" is dedicated to my father Clifton, who passed last year from Lung Cancer. 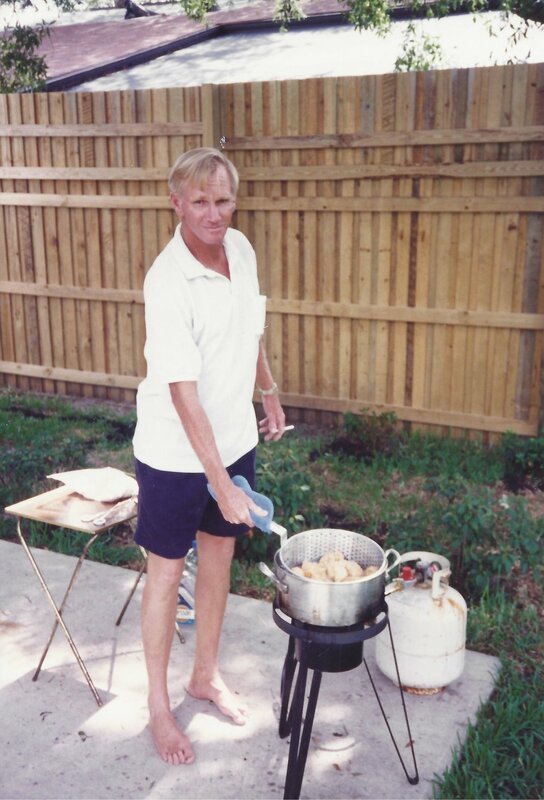 My fondest memories of my dad are in the town of Safety Harbor, Florida where I grew up as a child. Safety Harbor is home to many giant oaks many of which are hundreds of years old. We also had an Oak Tree that grew on my grandmother's property which later became my parent's. I used 2 different oak trees as references for this painting. Prior to my father’s passing I had wished I made him a grandfather. I apologized for not doing so multiple times in those final weeks. I always thought the old man would’ve been an ornery funny grandpa someday, but was undecided on children in my life. Not long after he passed, I found out I was pregnant and had been during his last days. My dad was supportive of my art making, hanging my paintings in his office at work and coming to every show. Along the branches are mementos and reminders of my father’s presence and influence in my life: framed and unframed art and a single Polaroid camera dangles close by the family. The oak tree in this painting is my father looking over me and my son on the swing; his face on the tree is the only one with eyes open. The other closed-eyed faces are the family members of the past, who made my father who he was, and he me. Going forward, I will be a mother and an artist, with the spirit of my father watching over us on this journey.